Laine Fischer scored one of the Gusties’ two goals on Wednesday evening in River Falls, Wis.
RIVER FALLS, Wis. – Despite two third period goals, the Gustavus Adolphus College women’s hockey team was not able to overcome a four-goal second period from UW-River Falls, and fell to the Falcons 4-2 on Wednesday evening at Hunt Arena. The loss drops the Gusties to 3-5-3 overall, while No. 8 UW-River Falls improves to 9-2-0. UW-River Falls used second period goals from four different individuals in Carly Moran, Paige Johnson, Chloe Kinsel, and Jessie Anderson to take a 4-0 lead heading into the final 20 minutes of play. 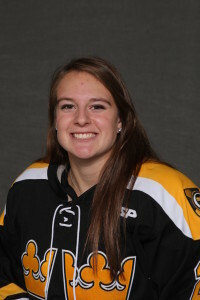 There, Gustavus’s Katy Fuller (So., Minneapolis, Minn.) scored her fourth goal of the season, and third in as many games off assists from Emily Reibert (Sr., Inver Grove Heights, Minn.) and Marina Chapman (Fy., South Haven, Minn.) to cut the deficit to three at the 8:39 mark. Laine Fischer (Fy., Northfield, Minn.) then made it a two goal game at the 16:07 mark with her second goal of the season off an assist from Erica Power (So., Lakeville, Minn.), but it was too little, too late, and the game ended with the Falcons leading 4-2. UW-River Falls outshot Gustavus 27-22. The Gusties’ Amanda DiNella (Fy., Oakbrook Terrace, Ill.) made 16 saves, but gave up all four goals and suffered the loss in 40 minutes of action before giving way to fellow rookie Paige Press (Cottage Grove, Minn.) in the third period. Press held the Falcons scoreless in the final 20 minutes and made seven saves. The Gusties conclude their series with the Falcons on Friday with a 7 p.m. matchup at Don Roberts Ice Rink in St. Peter, Minnesota.